With Spring Racing Carnival almost complete for another year, let’s take a look at some of the most memorable moments from key race days. What a ride it’s been! It was the moment every racing fan was keenly awaiting and the mighty Winx did not disappoint! A record breaking crowd of 38,035 people flocked to The Valley to watch the champion mare make history on October 27, winning her fourth consecutive W.S. Cox Plate title by an effortless two lengths and becoming the first horse to ever do so. Winx now has a world record 22 Group 1 wins to her name and accumulated almost $23m in prize money. 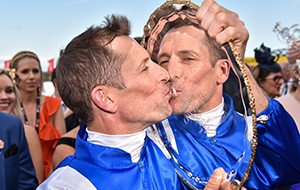 Want to relive Winx’s magical fourth Cox Plate win? You can watch it here. 2018 marked the 25th anniversary of international competition at the Spring Racing Carnival and Godolphin’s spring raiders celebrated the occasion by dominating several Group 1s across the carnival including two of the country’s most prestigious races. Charlie Appleby’s Jungle Cat began his early arrival to Australia in style by taking out the Sir Rupert Clarke Stakes while Saeed Bin Suroor continued the success at Caulfield, winning the Ladbrokes Stakes with Benbatl. Godolphin’s Group 1 glory then stepped up a notch when Pat Cosgrave rode Best Solution home to victory in the $5m Stella Artois Caulfield Cup, a race Saeed Bin Suroor had previously won in 2008 with All The Good. It was then Charlie Appleby’s time to shine again when Cross Counter claimed the $7.3m Lexus Melbourne Cup, making him the first British trainer to win Australia’s richest race over 3200m. A strong start from the barrier is often the key to a running a good race and that couldn’t be truer for trainer Darren Weir who has enjoyed an exemplary Spring Racing Carnival. The Ballarat-based trainer won the first Group 1 of the season – the New Zealand Bloodstock Memsie Stakes with Humidor and went on to claim another four top-tier races including the $1m Ladbrokes Manikato Stakes with Brave Smash and $2m Victoria Derby with Extra Brut, his first ever entry in the staying classic. Weir was also the most successful trainer of the Melbourne Cup Carnival with six wins in total, earning at least one on each day of the carnival. He also chalked up his 180th win of the season on Seppelt Wines Stakes Day and with three more key race meets left for Spring Racing Carnival 2018, be sure look out for more to come from one of Victoria’s top trainers in the weeks ahead! Everyone loves a good underdog story and it didn’t get much better than father/daughter duo Michelle and Paddy Payne creating a wonderful feel-good storyline on the third day of the Melbourne Cup Carnival. Riding for her father, Michelle Payne piloted 101-1 outsider Miner’s Miss to third place in the $1m Kennedy Oaks and later ranked the race as one of the highlights in her career. The filly, which was purchased for $10,500 had earlier given 82-year-old trainer Payne his first win since 2009 when she won in Avoca back in October. The luck of the Irish! Jockey John Allen had a Melbourne Cup Carnival to remember, notching up four winning rides including two unforgettable Group 1 races. His strong victory with Extra Brut in the $2m Victoria Derby was met with raucous celebrations from the winning connections in the Mounting Yard, earning him his first win at Group 1 level in Victoria. The former jumps jockey backed up the Derby with three wins on Stakes Day including a thrilling triumph in the Seppelt Mackinnon Stakes which saw Warrnambool trainer Jarrod McLean earn his first Group 1 win. 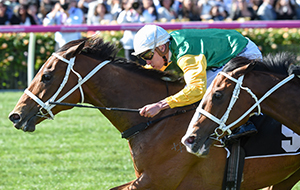 What was your favourite moment from Spring Racing Carnival 2018? Tweet us @springcarnival and let us know!